Happy totsgiving! That will be the new official name for thanksgiving because you’ll never want to serve any other dish ever again. This weekend is Canadian thanksgiving but I have a feeling everyone reading this couldn’t care less and will make this casserole no matter what day it is where you are right now. Digging into this was magic. 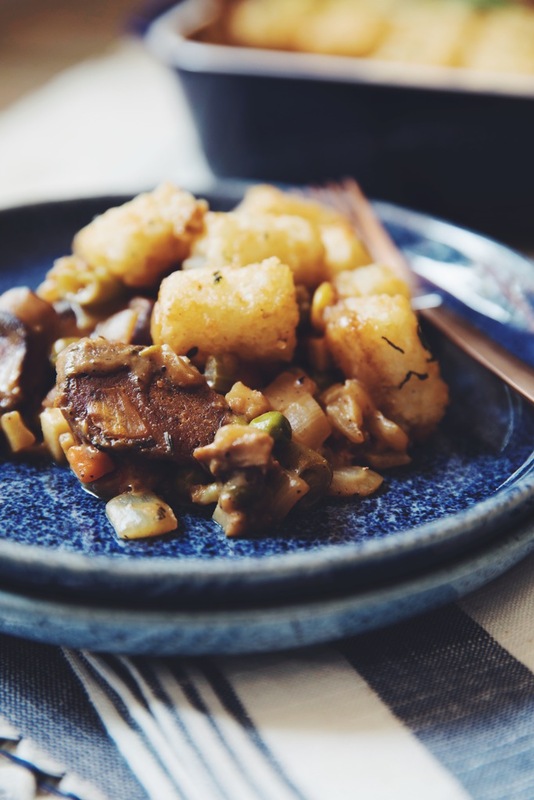 It has vegan sausage, veggies, apple, all smothered in a savory gravy, and duh, lotsa tots. If you’re looking for the dessert casserole get the recipe here. Happy totsgiving! Let this be the new official name for Thanksgiving because you’ll never want to serve any other dish ever again. Heat skillet or stock pot over medium heat with 2 tablespoons of vegetable oil and brown the sausage for about 6 minutes. Remove browned sausage from the pot. Add onion and celery and sauteé for 3 minutes. Add garlic, thyme, and sage and sauté for 3 minutes. Add bouillon, mustard, worcestershire, ground black pepper, and frozen vegetables and stir to combine well and sauté for another 3 minutes. If you don’t have vegan beef flavored bouillon, you can use a vegetable one. Add your browned sausage back in and then gradually add the flour a bit at a time while stirring to coat everything. Once it’s all incorporated, gradually add the nondairy milk and stir frequently to combine the flour well. Also scrape the hardened flour on the bottom of the pan or stock pot with the nondairy milk to incorporate all the browned flour. Use a wooden spatula with a flat end to do this so as to not scratch the pan or stock pot! Once all the browned bottom is well incorporated, keep stirring while the mixture thickens over a simmer. Just as it starts to thicken and bubble, remove from the heat and stir in the diced apple. Taste it and see if you want to add another 1/2 teaspoon of sea salt. Some people might think it's salty already. It will also depend on what kind of bouillon you used and if you swapped worcestershire for soy sauce, which is generally more salty. 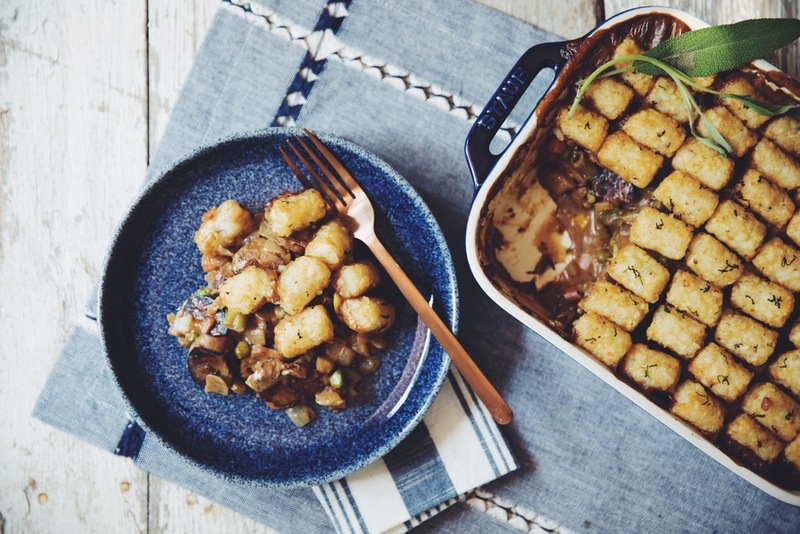 Transfer to an 8" x 11" casserole dish and top with the frozen tots and sprinkle with more fresh sage as garnish. Bake for 40 to 50 minutes or until the tots are golden brown and crispy. This looks AMAZING!!! Would I be able to make the filling the day before and then assemble and cook the day of? This was delicious! Also, I was feeling the desire to have some sort of sauce for it, but was wondering if you have any suggestions? Not quite a gravy, because that would be too redundant…but maybe like a cranberry sauce? Or something spicy….chipotle cranberry sauce? Is that a thing? I have a couple of cranberry sauces on the blog if you search! That could work! Where did you get the tots at? Did somebody already ask that? Vegan is a tough sport with all those fruits and nuts in your mouth. .. But potatoes and onions are a vegan gold mine and when you add rice and bean and greens you are in paradise. Ask Betsy the cow? So delicious! I made this for a family Christmas party where only my husband and I are vegan and EVERYBODY LOVED IT. Thanks Lauren! Truly great comfort food! We both loved it.